We propose a scenario that filamentary structure appears together with propagating waves on the scale of ion gyroradius. The method is based on two-dimensional ion particle-in-cell (or hybrid) simulation in low-beta plasmas. 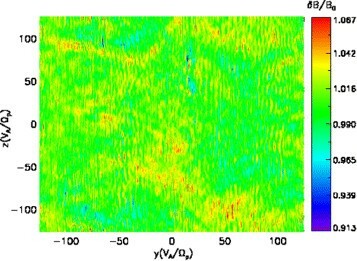 Coherent, filamentary structures in space plasmas are found as the zero-frequency mode in the wavenumber-frequency domain. The existence of the wave modes might be the key to understand filament formation in space plasmas. Recently suggested filamentary structures (or coherent structures in this letter) in situ in space plasmas (particularly in the solar wind) have shown that filament formation is more pronounced under the low-beta condition . The question arises naturally on the origin of such filaments. In fact, direct numerical simulations using both the fluid model and the particle-in-cell (PIC) method provide a growing amount of evidence that coherent structures are intrinsic to plasma turbulence, irrespective of the types of energy injection or driving mechanism such as Alfvén wave scattering or velocity shear causing the Kelvin-Helmholtz instability . Coherent, filamentary structures do not propagate, hence they appear as the zero-frequency mode in the wavevector-frequency domain, where the wavevectors are quasi-perpendicular to the large-scale magnetic field. Here we propose a scenario based on the ion PIC simulation (or hybrid plasma simulation) that coherent structures in plasma turbulence get excited together with highly-oblique electromagnetic waves such as whistler, ion Bernstein, and ion cyclotron modes, and furthermore, the structures might even be produced by the parametric decay of these waves. We use the hybrid code AIKEF , to generate ion-scale plasma turbulence (or kinetic turbulence) in the low-beta electron-proton plasma (beta 0.05) in the plane spanned by the directions parallel (∥) and perpendicular (⊥) to the large-scale constant magnetic field. AIKEF stands for Adaptive Ion Kinetic Electron Fluid, solving a set of Newtonian equation of motion for ions under Coulomb and Lorentz forces together with Maxwell equations. Electrons are treated as massless charge-neutralizing fluid. Advantage is that it can resolve ion gyration or kinetic effects. Disadvantage is that the strong electrostatic effects cannot develop because of electron fluid treatment. The AIKEF code is suited for plasma simulations at low beta. The upper limit of beta is determined by the computational load. Time integration in solar wind particle motions is a demanding task, and increasingly more particles need to be used in the simulation to ensure the integrability. Otherwise simulation is numerically unstable due to the formation of ‘vacuum cell’ originating in high mobility of thermal ions. The beta is set to 0.05 in order achieve longest possible simulation run. Fluctuation amplitude is set to 1% of the mean magnetic field to ensure that parallel and perpendicular directions are well established. Two different simulation boxes are set, one with the size 250 ion inertial lengths and 2048 mesh points in each direction (taken from our previous setup, see ) and the other 64 inertial lengths and 256 mesh points. The difference in the box size represents the difference in possible excitation modes (including both linear and nonlinear modes) or degree of freedom in the Fourier domain. The latter has a more limited degree of freedom, which is interesting to compare with the other one for the filament structure formation. A sufficient number of super-particles (clusters of particles) need to be put into the simulation box. We use 400 and 200 super-particles per cell, respectively. The initial condition is taken from , that is, 1000 discrete Alfvén waves are put on the fluid scale (up to the wavenumber k V A Ω p = 0.2 ) with the isotropic energy distribution. Zero-frequency means purely spatial structure with no propagation. Since excitation of eddies is forbidden in the present study due to the dimensionality and most of the fluctuation energy is contained along the wave vector perpendicular to the mean magnetic field, filaments are formed as spatial structures in the simulation (Figure 1). This result is in agreement with recent observation showing clear anisotropy preferring the picture of perpendicular cascade, e.g., . The filaments can be recognized in the first appearance in Figure 1 as the elongated fluctuation structure along the mean magnetic field (in the z-direction). It is, however, a time snapshot representation, which implies integration of the Fourier component over the frequencies. Therefore, both the zero-frequency mode and the propagating wave modes (e.g., whistler, Bernstein, and cyclotron modes) are present in the time snapshot. To decompose those elongated structures into non-propagating, coherent structure and propagating waves, the two-dimensional Fourier transform is applied in the data analysis. Time snapshot of elongated structures containing both filaments and propagating waves in the direction to the mean magnetic field direction (in the z -direction) for the large-box setting. Magnetic energy spectrum E ( k ⊥ , ω ) averaged over the spatial coordinates parallel to the large-scale magnetic field for two simulation boxes at an earlier evolution time (200 ion gyroperiods, t Ω p =200). The wave modes are marked by IB1 (ion Bernstein ω/Ω p = 1), IB2 (ion Bernstein ω/Ω p = 2), IC (ion cyclotron), and W (whistlers). The same panel style as in Figure2for the magnetic energy spectrum E ( k ⊥ , ω ) at a later evolution time. The description of the marks of the wave modes is the same as that in Figure 2.
that is, a spatially uniform field ends up with the spectrum with the peak at the origin of the wavenumber, κ=0. The large-scale inhomogeneity appears as the broadband spectrum at nearly-zero wavenumbers over a wide range frequencies. Several local peaks at the normalized frequencies in the range 4-6 (Figure 2, right panel, large-box setting) or around 5 (left panel, small-box setting) represent physically non-causal fluctuations, that is, the phase speed is so high that the whole system oscillates altogether with very large wavelengths. This effect most likely represents the numerical discretization effect because even ion Bernstein modes that may have small wavenumbers undergo strong damping at higher frequencies and cannot be sustained by the system for a long time . Turbulence evolution is similar between the two box-size setups in that both the zero-frequency mode (which is the coherent structure) and the propagating waves with dispersion relations appear, and they grow together. Yet, the identified dispersion relations are different between the two setups. The zero-frequency mode grows with the ion Bernstein (fundamental and harmonics) and oblique ion cyclotron wave modes for the small-box setting, while the fluctuation energy is already distributed among them and oblique whistlers for the large-box setting. Furthermore, we observe the following properties in the spectral evolution. First, the wavenumber range of the excited zero-frequency mode agrees with that of the ion Bernstein modes in the early-time spectrum for the small-box setting. Second, the existence of oblique ion cyclotron and whistler modes for the small- and large-box settings, respectively, is clearly visible in the late-time spectrum. Third, the zero-frequency mode has more energy at higher wavenumbers for the large-box setting. In the small-box setting the fluctuation energy of the whistler mode is weaker than that of the large-box setup by a factor about ten. The coherent, filamentary structure (identified as the zero-frequency mode) does not emerge alone, but it is accompanied by other wave modes. Our simulations show evidence of the co-existence of coherent modes and propagating modes on the kinetic scales. Oblique whistlers, ion cyclotron, and ion Bernstein modes accompany the zero-frequency mode both in the large- and small- box cases. Therefore, it is possible to excite the coherent structure even under a limited resolution in the spatial modes in that the wavevector interval Δ k is larger in the small-box simulation. We emphasize that the wave coupling theory can be extended to including the zero-frequency mode to explain the origin of the filamentary structures in space plasma, and furthermore, the wavenumber interval (or equivalently, the system size) plays an important role in the evolution scenario of the zero-frequency mode. In contrast to the linear Vlasov theory using plasma beta as the control parameter, the notion of “channel” needs to be incorporated to reveal the detailed excitation mechanism of the zero-frequency mode. We suggest that three-wave couplings must be occurring and propagating modes generate zero-frequency fluctuations. Even though resonant three-wave interactions are absent in the Sridhar-Goldreich weak Alfvénic turbulence model , there is a growing amount of evidence that three-wave couplings are ubiquitous in plasmas for the following reasons. (1) Three-wave coupling is present when the zero-frequency mode participates. In such an interaction, both the frequency and the parallel component of the wavevector are conserved . (2)The Sridhar-Goldreich theory is based on Newcomb’s Lagrangian in a simplified fashion in which the finite pressure effect is neglected. The complete form of Lagrangian for ideal magnetohydrodynamics was presented by Kaburaki and Uchida . In this formulation, the complete set of three-wave couplings exhibits all the possible combinations of the three magnetohydrodynamic modes. (3) The parametric decay involving three-wave coupling exists when there are different branches of dispersion relations in the system or the wave is dispersive by including the Hall term . In the former case, a large-amplitude Alfvén wave breaks into a backward-propagating Alfvén wave and a forward-propagating sound wave (referred to as the decay instability), and in the latter case, the pump wave breaks into sideband waves due to coupling with a long-wavelength wave (the modulational instability). (4) In the ion kinetic regime, the both conditions in the case (3) are satisfied. In fact, recently, the existence of the parametric decay in the ion kinetic regime was discussed and positively demonstrated by Jenkins et al. . In order to verify the three-wave coupling scenario for the growth of the zero-frequency mode, refined analysis would be needed such as higher-order statistics or by bicoherence analysis. We also suggest that the physical mechanism should be solved in near future in both simulation and observation. The coherent structure seems to represent the fundamental self-organization of plasma turbulence, and must be found in various space plasmas whenever they evolve into turbulence. This work was supported by Romanian Space Agency STAR project 11/2012, Collaborative Research Center 963, Astrophysical Flow, Instabilities, and Turbulence of the German Science Foundation, and FP7 313038/STORM. We also acknowledge North-German Supercomputing Alliance (Norddeutscher Verbund zur Förderung des Hoch- und Höchstleistungsrechnens - HLRN) for direct numerical simulations. HC: Simulation, interpretation, and writing. VC: Simulation, analysis, and help to draft the manuscript. YN: Revision. All authors read and approved the final manuscript.